By R.B. Quinn and Mindy Merrell of CheaterChef.Com. One of the joys of firing up your KettlePizza oven is knowing you’ve got leftover pizza ready for lunch or dinner over the next few days. And if you plan a little, you can create even more last-minute pizza options. That’s the beauty of making extra. Even better, delicious leftover homemade KettlePizza beats any brand of frozen pizza any day. You know the KettlePizza drill—you’ve got your dough relaxed and ready to stretch out on the peel, your sauce, cheese, and other toppings all lined up, and the KettlePizza temperature gauges are in the “Pizza Zone.” Now is the time to strike while it’s hot. 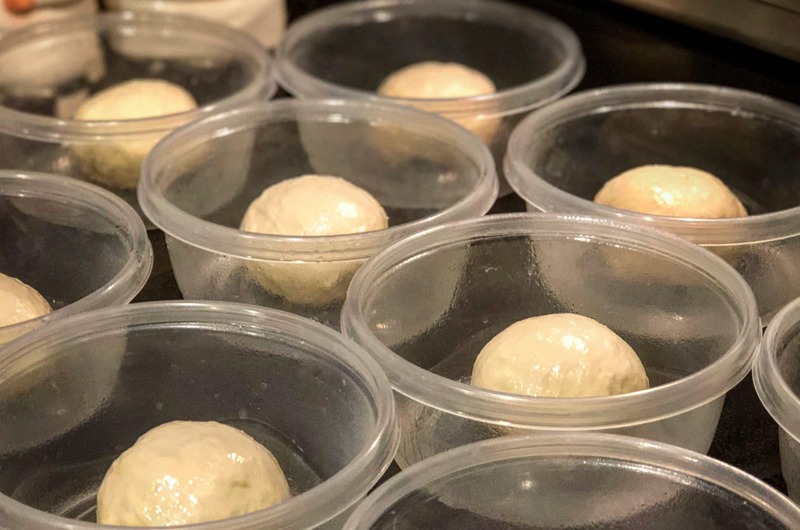 Mindy’s go-to dough recipe makes 6 medium pies, so that’s what we typically make for a KettlePizza session. That leaves us with the better part of 4 pies for later, unless the kids are home from school, in which case that number plummets to zero pies for later. As food writers, we do quite a bit of cooking at our house, usually more than we can eat ourselves. So, we’ve had to develop some reliable freezer management practices to get the most out of our efforts and avoid wasting good food. First, we always keep a supply of quart- and gallon-size sealable plastic freezer-grade bags, freezer masking tape, and Sharpie pens in the top kitchen drawer. How many times have you popped something into a bag or plastic container and into the freezer only to discover months later that you have no idea what’s inside and how long it’s been there? 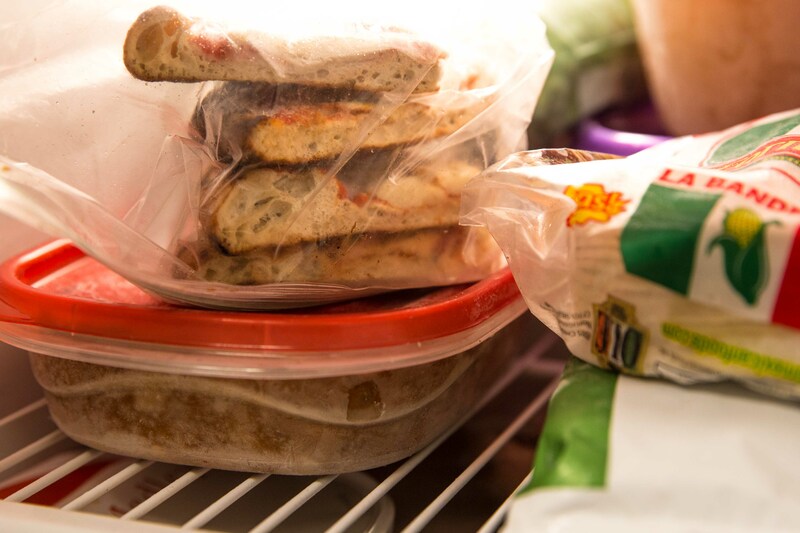 A quick note with a marker to name and date your leftovers on the bag or on freezer tape stuck onto the container can mean the difference between enjoying something you made previously, or tossing out the icy, frozen mystery food. Keep in mind that you can keep frozen cooked pizza at least a good couple of months without worry of freezer burn. We always cut the pies into slices so we can heat up just what we need. Slices are easier to store and easier for snacking and fitting into the toaster oven, too. The good news also is that you can spot the frozen triangle slices pretty easily in the freezer. The key is proper thawing and reheating to get the best result possible. As with all foods, the best practice is to thaw frozen foods in the refrigerator, not on the counter, to prevent encouraging bacteria from developing in foods above 34 (refrigerator temp) degrees. So, as you head out the door to work in the morning, put your frozen pizza bag in the fridge and they’ll be ready for dinnertime. Another great thing about a slice of pizza is that it really doesn’t need to be thawed to reheat well. So, you can go right from the freezer to the heat at the last minute for maximum last-minute flexibility. 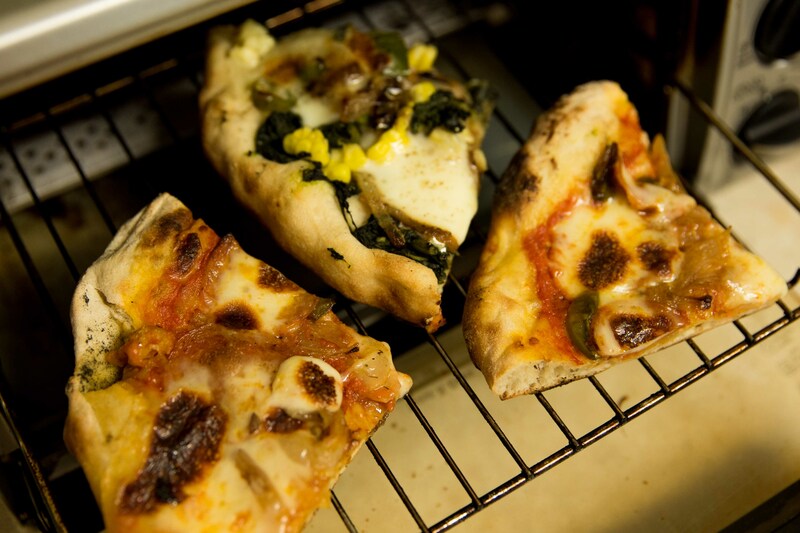 –No matter how you reheat pizza, the key is to stay at your post while the pizza heats up. Even when frozen, a slice of pizza takes only a couple minutes to get good and hot and the cheese and toppings safely heated. Too much heat and the crust will become hard and cracker-like, and the cheese and sauce will burn. Don’t leave your post! –For a few pieces we just use the toaster oven. 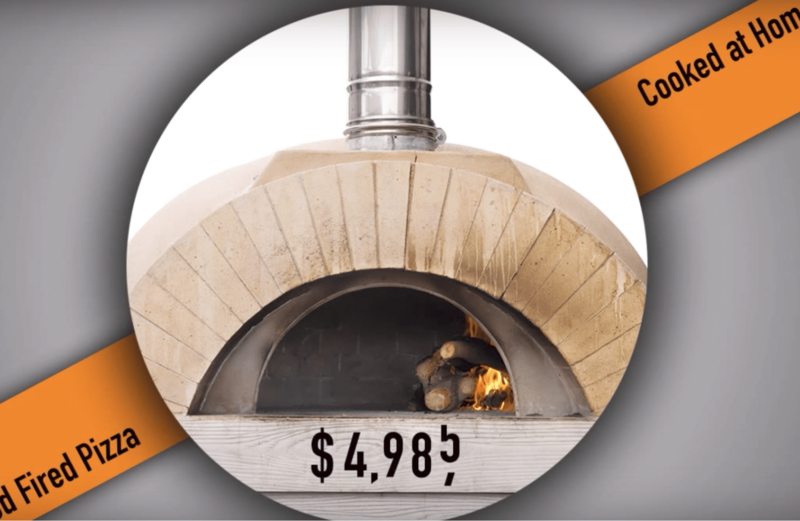 It heats up faster and creates less kitchen heat than the conventional oven. They usually hold 2 to 4 slices depending on your oven and slice sizes. Set it at about 400 degrees and set the slices right on the rack. Check your progress after a couple minutes, and when the slices are hot and bubbly, slide them onto a plate with your cooking tongs. –For lots of pizza, preheat your regular oven to about 375 degrees and set the pizza (or pizza slices) either right on the racks, on a baking sheet, or on a perforated, nonstick pizza pan. If you have a heavy load of toppings and cheese that might drip onto the oven bottom, use a pan and save making a mess. 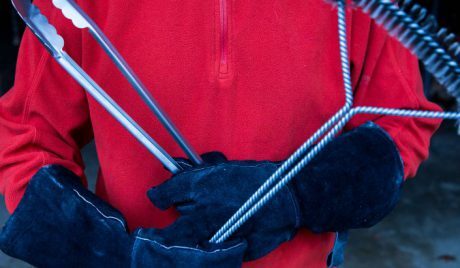 –Use your backyard grill. Medium heat is plenty hot enough to reheat pizza. Set slices on the grates, close the lid, and check them after a couple minutes. 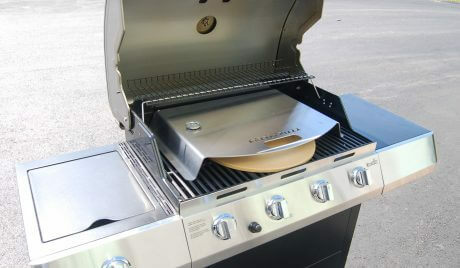 Using tongs, move the slices around as necessary to deal with the grill’s hot and cold spots to ensure even heating. 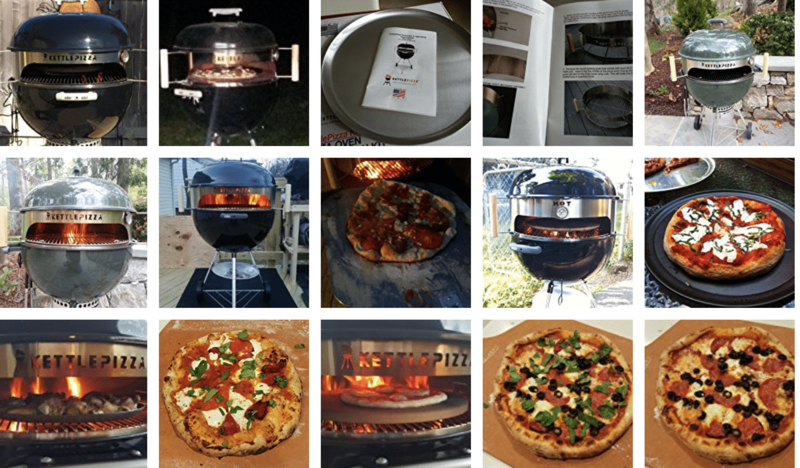 –Use your KettlePizza oven. If you’re making new pizza but have some frozen and want to enjoy that, too, slide your leftover slices right onto the KettlePizza stone and watch them bubble back to life.